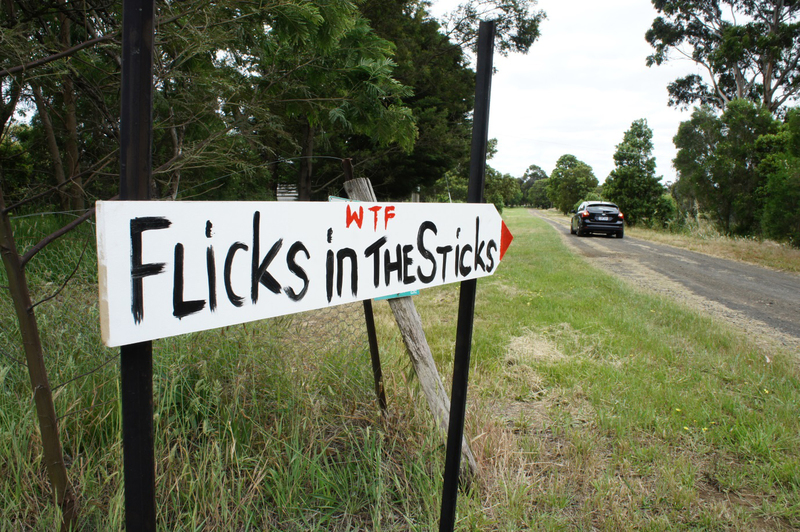 WESTERN FLICKERS GOES NORTH .. Way North! 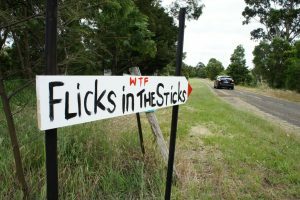 On a beautiful Melbourne spring day, the Western Flickers family headed up north to the little town of Willowmavin (about 1.5 hours north of Melbourne CBD). 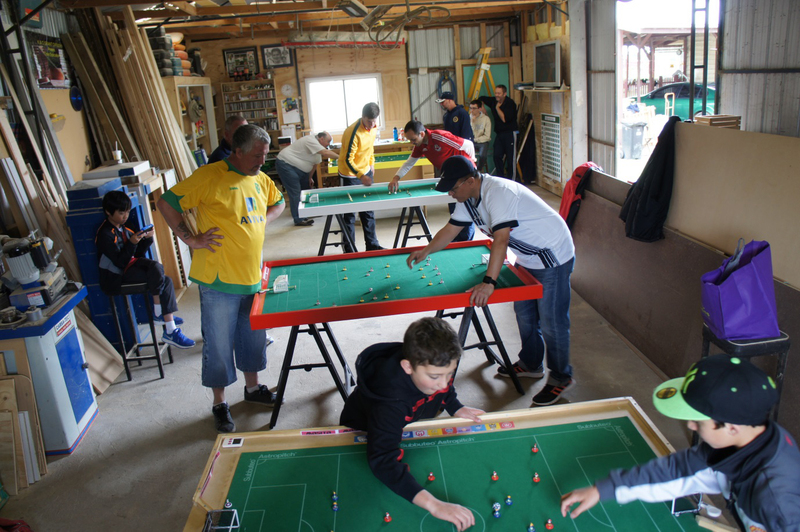 Thus far, all the table football events have been held in metropolitan Melbourne. 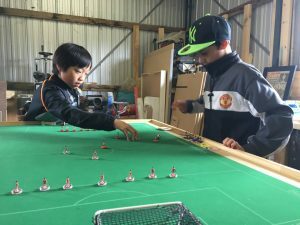 However, community engagement and promotion of the game in regional Victoria is very much part of the long term development roadmap for Western Flickers TFC. Despite the long trek, there was a great turnout of 8 flickers in the Open category and 3 kids in the Junior category. 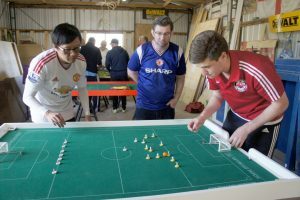 There were also a few non-players – like locally renowned Subbuteo memorabilia collector Paul Hindmarsh – who came to watch the exciting games and join the social activities. With a number of junior players unable to attend, it meant that Benjamin and the Briffa boys – Harrison and Alex – would compete for honours in a short simple single-leg round robin format. 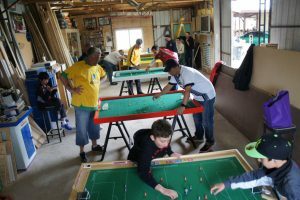 Both Harrison and Benjamin won their match against Alex by an identical score line, which meant that the final match between the two would decide the winner. It was a tight match where gilt-edged chances fell to both players. On the day, Benjamin’s clinical finishing was the difference and he emerged victorious. The final score was 2-0 though it did not reflect the close balance of play. Of special note is that the games were played with 2 x 15 minute halves, as opposed to the usual 10 minute halves. With the three juniors possibly competing at the Australian Grand Prix 2017 event in Sydney early next year, this was a good introduction (or refresher in Benjamin’s case) to the longer format. The 8 players in the Open category were split evenly into 2 groups, with the top 2 WASPA ranked players – Benny Ng and Benji Batten – spread across the groups. The rest were allocated randomly with the draw broadcast on Facebook Live. You can watch a repeat of the live broadcast draw video on the Western Flickers Facebook page (https://www.facebook.com/WesternFlickers/). The group results went pretty much as the rankings indicated. In Group 1, Benji steamrolled through the opposition scoring big wins. On the other hand, Christos just managed to scrape through to the next round on a slightly better goal difference over the senior Briffa (Simon). It was a much closer affair in Group 2 where former WASPA tournament winner David Simpson made an eagerly anticipated return to the sport after over a years’ absence. Despite being away for so long, he showed no signs of rustiness and held tournament top seed Benny to a goalless draw. With both David and Benny winning their remaining matches, it was to come down to goal difference. 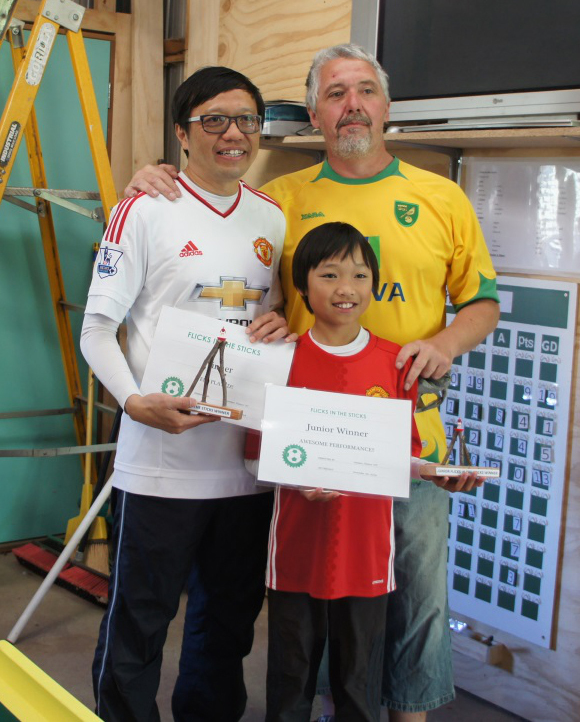 Thanks to Kevin’s masterful defending in his tie with David that kept the score down, Benny edged through to the semi-finals in group top position thus avoiding an early showdown with Benji in Group 1. The semi-finals were all extremely close affairs. 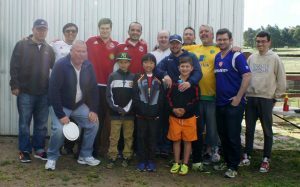 Benny defeated Christos is a tightly contested match 2-1, while Benji only got past David Simpson via a penalty shootout. It was no different in the grand final with not much between the players. Both players managed to break through the opposing defence with some magnificent goals, but it was tied 2-2 at full time. A penalty shootout ensued and Benny emerged victorious, continuing on his recent run of good form to complete a hat-trick of WASPA titles in a row. Thanks to all who attended for helping to make it another extremely successful Western Flickers WASPA event. Everyone had loads of fun playing the beautiful game and also enjoyed the camaraderie and food during the following BBQ. Table football was indeed the winner. P.S. If anyone is interested in taking part in future Western Flickers events or just popping by for chat and look-see, please visit the Western Flickers Facebook page (https://www.facebook.com/WesternFlickers/) and send us a message. This entry was posted in News and tagged waspa tournament, western flickers on 02/12/2016 by ajebec.